This section provides a tutorial example on how to perform XSD validation and view error list in XML Notepad 2007. 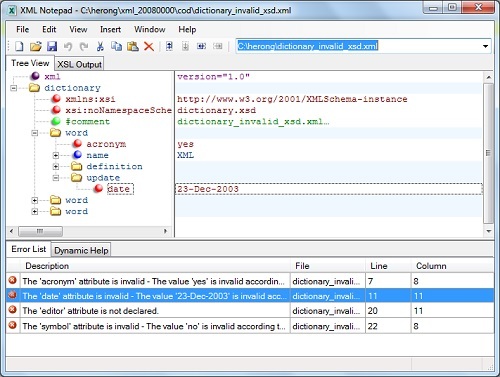 XML Notepad 2007 can also be used to perform XSD (XML Schema Definition) validations. 1. Open the following XML document in XML Notepad 2007. - Copyright (c) 2013 HerongYang.com, All Rights Reserved. 2. Look at the "Error List" area near the bottom. You see 4 errors generated from the automatic XSD validation, since the XSD file, dictionary.xsd, is provided in the XML document. 3. Click on the second error. XML Notepad 2007 automatically opens the attribute where this error is generated. If the XSD file is not provided in the XML document, you can specify it through menu "View" > "Schemas...".